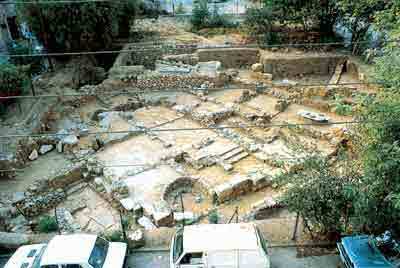 The Greek-Swedish excavations under the general direction of Dr Yannis Tzedakis in co-operation with Prof. Carl-Gustaf Styrenius cover almost 5000 years of the history of the settlement of Khania – from the transition between the Neolithic and the Early Bronze Age c. 3000 BC till the present day. Most of what can be seen today at the excavation site belongs to a part of the town, which was destroyed in a big conflagration c. 1450 BC or in the Late Minoan IB period. The houses were built in blocks and divided by narrow streets and squares. One house, House I measuring 225 m², has been completely excavated. From the street one entered an entrance hall, which gave access to the main room, the co-called Minoan Hall. From the entrance hall one could also enter a small lobby, from where a staircase led to the first floor, or one might continue into a combined kitchen and work-room, where the remains of a loom were discovered. Next to the kitchen was the storeroom of the house, and one of the vases found here contained 3 kg of burnt peas. In the same room two Linear A tablets with the Minoan script were found. Next to the storeroom was probably the treasury. 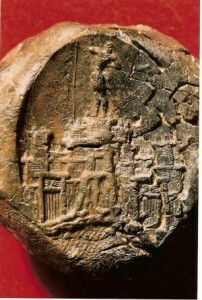 In it were found many decorated vessels, stone vases, seals, amulets, jewelry and sealings. The most spectacular find is a clay bar with twelve seal impressions. All in all, the house contained more than 300 complete vessels. Bordering House I to the southwest, lies House IV, where one of the upper rooms had been decorated with frescoes.After the destruction people returned and settled in the ruins. In a dump from this period, the famous Master Impression was discovered. Only in Late Minoan IIIA (c. 1350 BC) were new houses built on the site. These houses were destroyed in a fire about a hundred years later. From the destruction layer were retrieved the fragments of Linear B tablets written in the earliest known Greek. From the same layer come many fragments of stirrup jars inscribed with Linear B signs. In this and the following period (Late Minoan IIIA and IIIB) the local Kydonian pottery workshop flourished, the products of which have been identified all over Crete, in the Aegean and from Sardinia in the west to Cyprus in the east. The settlement was rebuilt and habitation continued into the 12th century BC (Late Minoan IIIC). In the Late Geometric period (late 8th century BC) people returned to the site, which has been inhabited ever since. The most impressive remains from the post-Minoan levels are the deep wall foundations of Venetian and Ottoman buildings. Everywhere outside and below the floors of the LMI houses, pre-palatial remains with good quality architecture of the EMII/III and MMIA periods were discovered. The pro-palatial settlement was leveled in connection with the construction of the LMI houses, but we know that the period existed thanks to the finds of good quality Kamares pottery, eggshell ware and stones with mason’s marks. The earliest period at the site, the transition from Neolithic to the Early Bronze Age, is so far represented only by pottery.